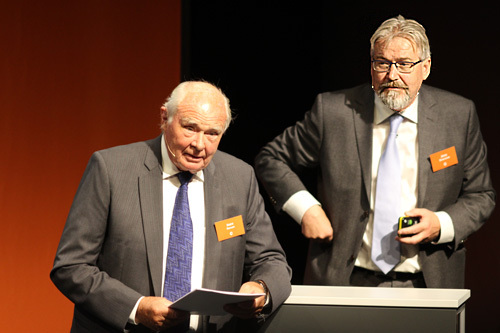 Early 2000, Jónas Einarsson, CEO at the Radium Hospital Research Foundation, and Kaare Norum, former principal of the University of Oslo, realized that a natural cluster for cancer research, development and innovation emerged in the Oslo-area. Together they established Oslo Cancer Cluster, a research and industry cluster within cancer. Oslo Cancer Cluster Innovation Park AS was officially opened August 24th 2015 by the Prime Minister of Norway, Erna Solberg. This unique project is built on private enthusiasm and builds on the long history of cancer research and treatment performed at the Norwegian Radium Hospital. The Innovation Park includes Ullern High School, The Cancer Registry of Norway, Oslo Cancer Cluster Incubator, and Institute for Medical Informatics and Pathology at Oslo University Hospital – as well as global biopharmaceutical and biotech companies. The innovation park has a total space: 36 000 m².